I recently had the pleasure to write an article for the DropAstyle blog, which is basically a platform where one can discover new styles within the community. So you might want to head over there for some fashion inspiration and style stalking! My article can be found here in case you are interested in having a little glance at it. But even though some of you have already seen this outfit on the dropAstyle blog I still want to share some more photos of it on my blog as well! Autumn is finally here to the fullest and winter is already coming through! A real challenge for me and all the other frostbites among us! For this look I combined an outstanding bodysuit with a black fur vest and simple jeans. 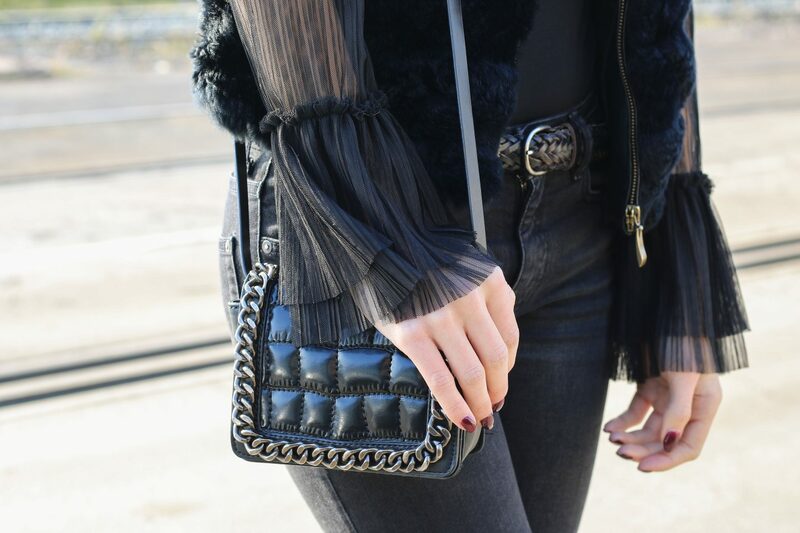 The vest keeps me perfectly warm and draws all the attention to the eye-cacher of the entire outfit: the sleeves of tulle! Needless to add that this tulle bodysuit quickly became my favorite go-to item since it wasn’t only a real bargain but also updates everything casual due its slight point of difference, which sets it apart from the usual bodysuit. Speaking of bargains: Happy black friday weekend! I hope all of you could catch some great stuff during this shopping craziness! I definitely did shopped a lot online until my credit card started to beg for a rest! All my favorite pieces can be found in my online shop (here)! Das Outfit gefällt mir super gut! Der Body ist echt der Hammer. Auch der Beitrag bei DropAstyle ist super geworden.